1-866-666-0340 Ask For A Quote! Our company is a strong resource for liquidating and selling your IT closeouts, surplus data center equipment, and overstock electronic inventory. We provide our customers with a liquidation service that is trustworthy, efficient, and cost effective. AZCO technology inventory liquidators specializing in the sale of department store and brand name closeouts. Our liquidation services provide you a range of asset recovery options to maximize the value you recover. A-Z Big Box Liquidators handle overstocks, returns etc from Wal-Mart, Costco, Sams Clubs, Circuit City and more. Headquartered in California, we buy merchandise nationwide. 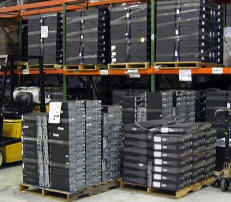 Email us your list of surplus merchandise available for a quote. We buy open-box, returns, overstock surplus computer, network equipment, and Cisco and electronic equipment. We buy open box items that include: Televisions, Mac Laptops and Computers, and Electronic Surplus.